"Out of the five acres received from the people of Margibi since 2014, only two acres are now available. And this is worrisome because lots of dead bodies are transported here frequently for burial," Pellewuwan said. "We do not refuse them. All we do is to verify that they are truly less fortunate people or are from charity organizations like Black Gate (HIV-AIDS compound), TB Annex as well as criminals who are murdered by mob justice," he added. "We were twenty six but due to the lack of incentives from government, majority of the workers here have left. Our number reduced to eight but even at that, government has not been able to look after us," he said, adding, "Even the four of us who are still keeping up this place are not well taken care of. I am the only one, in fact, on a regular stipend." "The thing that should be appreciated here is that, on Decoration Day, no one comes here to clean a grave but lays his or her flowers and wreaths on the grave of his or her loved one(s). We do everything. Is this not a good thing?" he rhetorically asked. "Even though it is sad to lose loved ones, giving one's loved one a befitting burial, particularly in a secure environment, is a very great achievement," Clarke said. "Things are no longer as they used to be here. We are seeing lots of challenges such as lack of proper care of the site," he said. "Whenever I come here I am overwhelmed by emotions from many people who visit this place on Decoration Day. I personal share tears imagining the way our people lost their lives in 2014 and 2015," Tarponweh said. 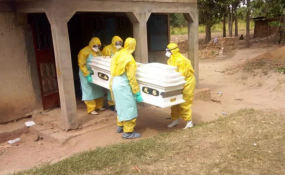 He said prior to the ashes and bones' being taken to the Disco Hill burial site, the cremation of Ebola victims was done in his neighborhood of Boys Town. "I have a picture of the impact of the EVD in my mind, because I was here. I saw the many tears people shared for their loved ones, who lost their lives to the EVD. We all have to remember the effects of the EVD and learn never to fall prey to it anymore," he admonished. "For the sanity of this place, it is my kind appeal that those taking care of this place be compensated. We should not afford to lose this place to bush and other harmful practices," he concluded. "That place is not intended for the burial of just any kind of dead bodies. After the EVD, the only bodies that should buried there are those from TB Annex, and other areas where contagious diseases have hit a population. Other than those, no one is allowed to take a dead body there for burial on the basis of poverty," he said, adding that the NPHIL will investigate all burials done at the site in recent times. "We need money to get that place up to a tourism standard," he said.